I was in a meeting upstairs when our TV producer, Joan Omionawele called me on the phone. Strange, because she knew I was engaged at the moment. I didn’t pick up. She called twice again and I was immediately suspicious. What’s going on in the newsroom? I didn’t have to wonder for long: she came to the office where I was meeting and crashed it. ‘Sorry Jide, but there’s something really important you need to know.’ I excused myself from the meeting and walked with her. Then she told me Chime Amaechi‘s family members were here. Chime who? ‘Chime now. The other guy that died with Davido’s DJ in Banana Island.’ ‘Oh shoot!’ I said. That’s important. Here’s why it was important: even I had wondered who Chime was. 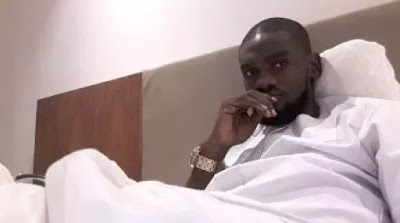 It seemed like his death, compared to Tagbo‘s – which Caroline Danjuma made a big fuss about – and DJ Olu’s – who got a lot of media coverage probably because of his billionaire father – did not interest anybody. Apart from the Punch report earlier in the day that claimed ‘hard drugs’ were recovered from the death scene, not much was being said about the ‘third Davido associate’. As we went upstairs to the lounge where they were waiting, I could hear a man’s voice saying ‘No no, nothing like that. I’m surprised myself. My son was not a drug user.’ We got in and I saw a family huddled together in silence: father folded his arms across his chest, the sisters glancing at their phones and shaking their heads intermittently. The scene looked like gloomy French pantomime. ‘Good afternoon sir…’ I began tentatively. How does one comfort a parent whose child had just died? Plus I’m not their friend or a family member: I’m a newsman who wants to get the story from them; how does one do that without coming across as insincere? They responded quite well and I told them what we wanted from them: just to share their story. Is that fine with you? Father said yes and stood up. Let’s go he said, as we all made our way back to the studio. Up on till this moment, the most that had been said about the Chime was that ‘he died with DJ Olu’, as though he was inconsequential. And that’s how it sometimes happens, when a less popular individual dies in company of famous people. When Princess Diana died, the whole world stood still. Even her boyfriend Dodi El-Fayed was less talked about than she – and the third casualty of the night, Henri Paul, is rarely mentioned, as though he was a postscript to the tragedy. In the same vein, Chime Amaechi got lost in the ‘Davido’s friend’ chatter. But who was he, how did he get involved in this macabre story? ‘He was a good son’, his father began. ‘He wasn’t a riffraff that was hanging around Davido looking for handouts…no, no. He and Olu Abiodun were childhood friends in Ibadan. Mr. Amaechi is a real estate surveyor and valuer in Ibadan, possibly the second thriving metropolis in south-west Nigeria, after Lagos. He may have earned a decent living enough to send his children to quality schools, but he was no Dapo Abiodun – billionaire oil magnate and politician – nor for that matter, Adedeji Adeleke. Soon as it often happens with childhood friends, life does what it does: Olu was sent off to the UK to continue his studies while Chime remained in Ibadan. In time, he got admitted to the University of Lagos and attempted to get a university degree. It wasn’t to be. He and Olu would later reunite on social media and rekindle their friendship. By this time Olu had met Davido and was getting involved in the music as official DJ. On one of his trips back home, he and Chime decided to do business. Olu was an oil firm heir and had access to small, but very profitable ventures. ‘Olu’s father owns Heyden Petroleum and he with Chime used to transport petroleum products, in thousands of litres, across the whole country,’ Chime’s sister Sopulu said. ‘They also had real estate that they were marketing and getting commissions from. Even last week, he still sent me pictures of a parcel of land to market in Ibadan,’ her father added. And really what was the point of slaving away in class? The elderly man may not get it but Chime was living every young man’s dream: he shared a flat with Olu in Banana Island, money was flowing in steadily and his celebrity connection was on point. To put it into perspective: he was only 23 years old on his last birthday in February. He’s been living the good life since he was 19. School for what? ‘We were at home in Ibadan, when a family friend who does not normally call came to the house with his wife. They said Chime was in an accident and we should pack our bags and come with them to Lagos. It was very strange to me and I wondered what was going on,’ Mr. Amaechi said. It didn’t take much longer to realize that Chime was dead. The family made their way to the morgue and Lagos State University Teaching Hospital in Ikeja. No parent should have to recall looking at their child’s corpse. As Chime’s father spoke, he masked his pain bravely; a trait that his daughter, Sopulu, must have also picked up. Neither of them shed into tears as they spoke to us, their voices only trailing off for a few seconds at intervals. The rest of the family sobbed quietly in the corner, trying to be strong in public but failing at it. However, the family is convinced that this was no ordinary death, or an overdose as reported in the media. Sopulu in particular is insistent that they were murdered. Again, one would not expect that grieving parents would agree that it was a possibility that their child used drugs. After all, he was young and considerably successful. As we’ve seen in successful people all across the world, drugs didn’t have to be big deal that they couldn’t get if they wanted. Like Lamar Odom said about his wife, Khloe Kardashian, not knowing of his drug addiction when they were married, ‘I had money in my pocket; I could score when I wanted.’ Perhaps an autopsy would give them closure – Chime’s death could have been as a result of an overdose. But we were not satisfied. The report the family gave of Chime was of a nice, easygoing, gentle soul. Why would anyone then want to murder him? Could it be blow-back from the unresolved Tagbo death few days earlier which Davido had been accused of being complicit in? Were Olu and Chime killed to prevent them from talking about Tagbo’s death? Chime’s family disagrees. They don’t think the singer was involved at all. They think it’s one of the unfair media coverage they’ve received. His father told us that the friends had been distancing themselves from music to focus on ‘real business’. They may never find the answers, or if they do, they may never accept the answers. The death of a child is never an easy thing to swallow and most parents never recover from the shock, the grief, the guilt. As they believe that Chime was Olu’s ‘guardian angel’, the questions will always tug at their minds: what if they had never met? What if their friendship had ended when Olu left for Middlesex University? What if Chime had stayed in school himself? A thousand and one ‘what-ifs’ and they may never find an answer.